Clean the clams under running water to wash out any impurities. Heat the olive oil in a large saucepan and then add the shallot. Sweat until soft and then add the shellfish, the crushed garlic clove, the thyme and the bouquet garni. Add the white wine and then enough water to cover the shellfish. Cover with a lid and bring to the boil. Remove the shellfish from the liquid and remove them from the shells (keeping a few whole to use as a garnish). Pass the cooking liquid through a sieve. Pick and finely chop the parsley, keeping a couple of sprigs whole to use as decoration. Zest and juice the lemon. The juice will be used when cooking the sea bass. Peel and dice the onion. Add to a hot pan with a dash of olive oil and a pinch of salt. Once the onion is soft, add the rice and stir to coat in oil. Add the white wine to the pan and allow to reduce before starting to add the shellfish stock. Add the stock a ladleful at a time, allowing the last addition to be absorbed before adding more. The risotto should take around 18 minutes to cook. Once cooked, incorporate the butter, lemon zest and grated parmesan. Season and then stir in the shelled mussels and clams and the parsley. Remove all of the pin bones from the sea bass fillets and then cut each fillet into 4 pieces. Season with salt. Heat a frying pan and add olive oil. Add the fish to the pan and cook until golden brown on both sides. Add the lemon juice to the pan and spoon it over the fish. 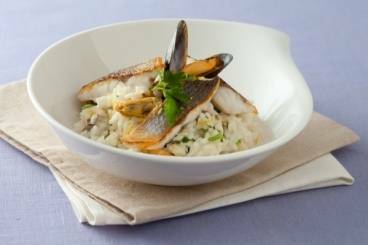 Plate the risotto and then arrange the sea bass on top. Finish with a couple of clams and mussels and garnish with fresh parsley. Serve immediately.